The relaxation practice of being buoyant in approximately 10 inches of water in a solution of 1,000 pounds of magnesium sulfate, otherwise known as Epsom Salts. Float 60 or 90 minutes - some like it even longer! The temperature of the water is set to the body's normal skin temperature. This practice can be accomplished in a special floatation device like a float pod, a floatation tank or a float room. Some may have heard of a sensory deprivation tank, this is the same type of device as mentioned above. DON'T WONDER - BOOK YOUR FLOAT NOW! I booked my float, now what happens? Once you have booked your float you may be wondering what happens when you arrive. Here is an overview of what to expect! Float Tips: Before your appointment, lay low on caffeine and don't eat a big meal before you float. This will minimize your distractions. Don't shave your legs! It WILL sting. If you just dyed your hair don't book an appointment until the water runs clear in your shower. Your hair dye will stain our tanks and we will have to charge you a cleaning fee. Arrival: Arrive for your float about 15-20 early and make sure you are booked at the right location. Check in with the Float Sixty staff and sign the waiver if you didn't do it online prior to your appointment. Use the restroom prior to entering your personal float suite. When your suite is ready, you will be walked back for your pre-float orientation. We recommend removing your contacts. If you do not have a contact case/solution we will provide this at no cost, just ask us. Amenities in your Float Suite: Ear Plugs, Cotton Swabs in case you need them, loofah, petroleum jelly to protect small cuts, vinegar water solution to dissolve salt from ears if needed. Shower Gel, Shampoo & Conditioner are also provided. Pre-Float Shower: Fully disrobe and protect clothing from floor (use shelves or hooks). Place ear plugs in your ears before your shower to improve the seal. Shampoo and rinse hair thoroughly. Use loofah and shower gel to scrub all oils from your body. Do NOT use conditioner before your float session. 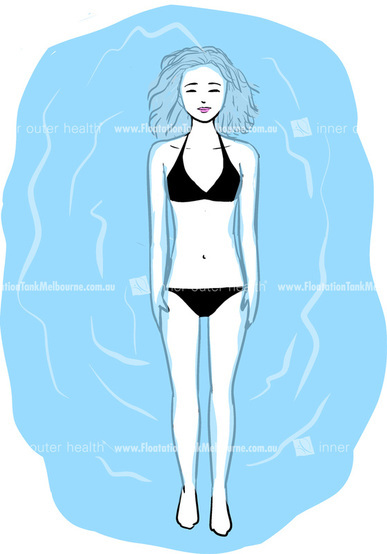 Carefully dry face before you enter the float tank to prevent the distraction of water trickling down your face. Enter float tank completely unclothed. Sixty Minute Float Session: With your ear plugs in, carefully enter the float tank using the handle. Sit down in the water and lie back gently. The silky salt solution is heated to about 93 degrees or the temperature of your skin. The solution will lift your body allowing you to float effortlessly. Adjust the light if available/desired and close your eyes. Let the water cushion your body and find a comfortable floating position - arms out to side, crossed in front, whatever works the best for you. Breath deeply and relax, notice your breath and heartbeat. Listen to your body and be aware of how your muscles are relaxing over the time you are spending. When your session is over, the tank lights and/or music will fade in or you may hear the float filtration sanitation systems kicking on. Carefully sit up and find your way to the handle or grip bar to support you as you get out of the tank. Prepare for post-float shower by removing your ear plugs and discarding them in the small trash can. Post-Float Shower: Enter the shower and rinse the salty solution from your body thoroughly. Provided you arrived on time, you will have plenty of time to take a long hot relaxing shower and you'll want to spend extra time rinsing your hair and ears. Use shampoo and conditioner now and the loofah and shower gel. After showering, get dressed and proceed to meditation or calm room to enjoy our complimentary signature hot tea or water. Hair Station: We provide a full line of professional hair and skin care products for both men and women. From beard oil to hair gel, we have you covered. We have a Dyson Hair Dryer for your use as well as a curling/flat iron, hair brush etc. Before Leaving Float Sixty: Check out with a Float Sixty team member. If you have a voucher from one of our marketing partners you can add it to your account and take advantage of our first time float offer if eligible. Our first time float is a special one time price and is usually a better rate than a marketing offer. We offer several different promotions, packages and memberships that are available for purchase. Enjoy your Post Float Glow!